Exporter of a wide range of products which include n95 particulate respirator, surgical mask, adhesive wound dressing, lab coats, surgical glove and surgeon gowns. Our major products are N-95 masks, Swine flu mask, Tie mask, Disposable mask, Ear loop Mask, respirators, dust masks (FFP1 and FFP2), N 95 respirators, face masks, surgical caps, bouffant caps, Dust Mask, Shoe Cover, HIV kits thereof. To match up the varying demands of the customers, we are engaged in offering a wide range of Surgical Mask. This Surgical Mask is made from quality material and available in various sizes. Our Surgical Mask is highly acclaimed amongst the customers for their fine finish. Moreover, the offered product is used in hospitals, medicals and many more application areas. Owing to the presence of our expert team members, we are engaged in catering a wide range of Lab Coats. Our offered range of products is available at market leading prices along with unmatched quality. Our ranges of products are processed under the strict supervision of our quality experts. This Lab Coats is free from any kind of manufacturing flaws and perfectly stitched using highly advanced machinery and other equipments. With our expertise in domain, we are engaged in offering an extensive range of Surgical Glove. We offer Surgical Glove to our patrons in different sizes and keep the hands free from germs. This Surgical Glove is used by doctors, nurses and many more people and helps in maintaining health. 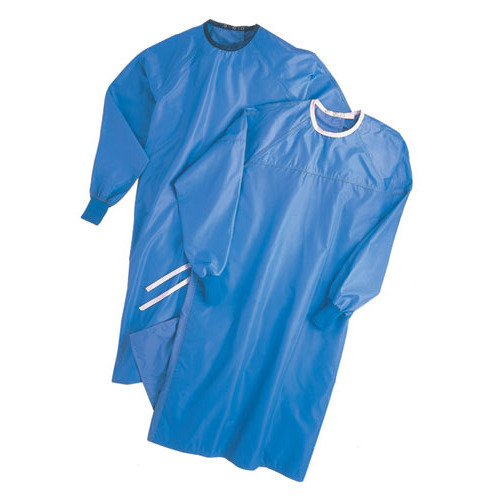 Surgical Overlapping Gown is primarily wear by doctors during operation. This is made of vat dyed green or sky blue casement fabric. Moreover, we also provide the customization facility of this range as per the precise requirements.